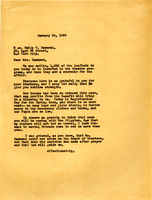 A letter informing Mrs. Hammond on the leaflets that were being sent for the Benefit and telling her what dire circumstances the College was in. 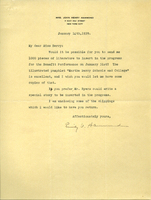 In this letter Emily Hammond asks Martha Berry for 1,000 pieces of literature for the Benefit Performance on January 31st. 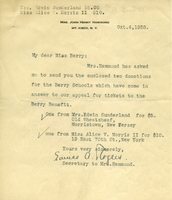 A note of donations made by Mrs. Edwin Sunderland and Miss Alice Morris II for tickets to the Berry Benefit.